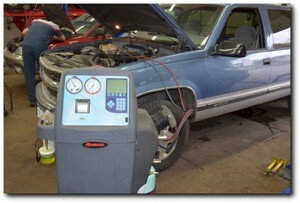 Astro offers complete air conditioning and heating systems services and diagnostics. Including but not limited to compressor, evaporator, condenser, receiver dryer, heater core, mode/blend door actuator replacement, evacuate, flush and recharge a/c refrigerant and a/c oil. 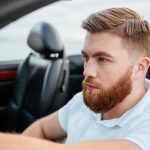 The air conditioning not blowing cold is the most common complaint. Usually this is caused by a loss of refrigerant from a leak which in turn won’t activate the compressor. To diagnose this problem an Astro technician will add a small amount of refrigerant and then use a digital leak detector to locate the leak. We will estimate the cost of repair at that time. This repair will include an evacuation and recharge of the system after the leak has been repaired. A lack of heat from your vehicle’s heater is usually caused by a lack of coolant or faulty thermostat. A common cause of coolant loss is a leaky water pump. If your windshield fogs with the defroster on or if there is a sweet smell or taste in the air, you may have a leak in the heater core. If a leak is the diagnosis, the heater core will need to be replaced. 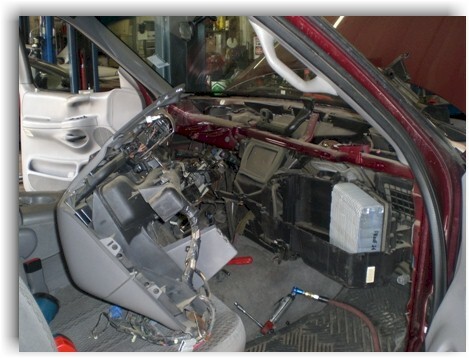 Depending on the vehicle, this could be a simple job or an incredibly difficult and time consuming job requiring the entire dash assembly to be removed from the vehicle in order to access the heater core. Another often overlooked item is the cabin air filter. This is a filter that is mounted in front of the HVAC system air intake. It filters all the air that comes out of your vents and heater ducts while using the air conditioning, heater or fresh air vents. These filters get very dirty, sometimes even restricting the air flow. They should be replaced every 15,000 miles.